All-in-One Sidebar is a sidebar control, inspired by Opera's. It lets you quickly switch between sidebars, view dialog windows such as downloads, extensions, and more in the sidebar, or view source code or Web sites in the sidebar. It currently includes a slide-out button and a toolbar, all of which can be extensively customized. 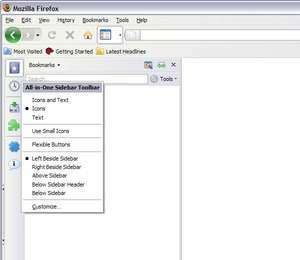 All-In-One Sidebar provides also enhancements for many built-in and extension features and some extra features. Version 0.7.22 is a freeware program which does not have restrictions and it's free so it doesn't cost anything. For security reasons, you should also check out the All-in-One Sidebar download at LO4D.com which includes virus and malware tests. Additional screenshots of this application download may be available, too.